But more than anything, I love the overindulgence. When comfort food meets snack food, it’s a beautiful thing. And these Crispy Fish Cakes smothered in tangy Lemon Caper Yogurt Dip are delicious proof. If you plan on entertaining over the holidays, you *need* these nom-worthy cakes on your menu, my friends. King Oscar’s Mackerel in Olive Oil. My love for crispy fish cakes started years ago with crab cakes. And as much as I love crab, it can be difficult to find canned sustainable crab — not to mention the fact that crab comes with a hefty price tag. Tuna is another popular option for fish cakes, but since discovering King Oscar’s mackerel fillets, I am totally and completely over tuna. My love for King Oscar’s melt-in-your-mouth fillets started with this wrap and continues to stay strong with these glorious fish cakes. This North Atlantic “scomber scrombus” mackerel is a smaller species that sits lower on the food chain. It’s sustainably wild-caught from the Northeast Atlantic Ocean between Norway and the Faroe Islands, and that alone speaks for the high quality of these meaty fillets. I’m not even ashamed to admit that I ate over half of these myself after shooting photos. Despite their wow factor, these fish cakes are made up of simple ingredients including King Oscar’s Mackerel in Olive Oil, scallions, tangy Dijon mustard, lemon juice, familiar spices, Panko bread crumbs, and an egg. Easy peasy. And of course, every crispy-fried snack need a smear of creamy dip. The yogurt dip is a simple mix of plain Greek yogurt, briny capers, lemon juice, Worcestershire sauce, and freshly chopped parsley. It pairs ah-mazingly with these crunchy gems, but if you decide to go with your own concoction, be sure to let me know! I love hearing about your creations. Not sure if King Oscar products are available near you? Find out here. 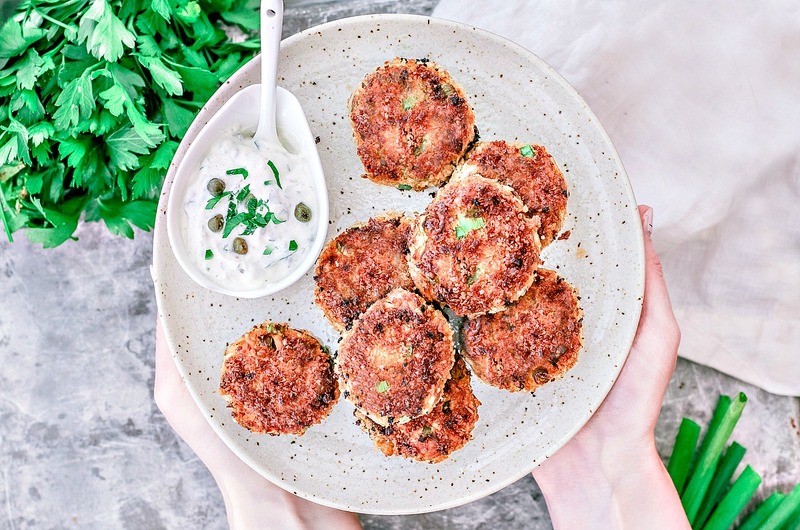 These Crispy Fish Cakes are perfect for entertaining. They're quick, easy to make, call for simple ingredients, and are downright crave-worthy. Add the drained mackerel to a medium-sized bowl. Roughly flake it with a fork until it's shredded up. Add the scallions, lemon juice, Dijon mustard, paprika, salt, and pepper. Mix well and taste. Adjust seasoning if needed, then add the beaten egg and 1/4 cup of the Panko breadcrumbs; mix until cohesive. With a tablespoon, scoop up a heaping helping of the mixture and form it into a small puck, placing them on a parchment-lined cookie sheet. You should end up with eight cakes. When done, transfer them to the fridge and let them sit for 15 minutes to help them firm up so they don't fall apart. In the meantime, make your dip. Once the cakes have set, remove them from the fridge. Fill a small bowl or pie plate with the remaining Panko bread crumbs. Carefully press and coat each puck in the panko bread crumbs on all sides; set aside on a plate. Cover the bottom of a small to mediuam (10-12 inch) frying pan with olive oil (you can also use the reserved oil from the can of mackerel here) and heat over medium until the oil starts to lightly smoke. Carefully transfer the cakes to the pan and saute for 2 to 3 minutes on each side, or until they're golden brown in color. When done, transfer them to a cooling rack and let cool for about five minutes before serving serve with dip! In a small bowl, mix all of the ingredients together until well blended. Taste, and adjust to your liking. Garnish with freshly chopped parsley and serve with Crispy Fish Cakes. These looks delicious! Thank you for sharing! Interesting. I'm a HUGE fan of their sardines. I'll have to try the mackerel. Thx for the recipe! I love King Oscar boneless skinless sardines; I eat several cans a week. I'm very interested in trying their mackerel. Seems like it might have a deeper and more complex flavor. Thanks for the recipe! I definitely recommend their mackerel! I'm hooked on it! Let me know when you try it, I'd love to hear your thoughts. Both the mackerel in olive oil and Mediterranean style are phenomenal. I was impressed with how well they worked with these cakes. The mackerel is super moist, so I thought the cakes might fall apart, but they held together and still offered a super moist bite! That yogurt dip sounds great. These would be great for the holidays! I can see this being a huge hit at my annual Yankee Swap party. I'll just make bite size minis and I know the ladies will love them. These look absolutely mouthwatering! ???? ?